The German political left wing of the late sixties/early seventies helped in no small manner to give rise to a number of rock bands who used their music to promote their political beliefs. 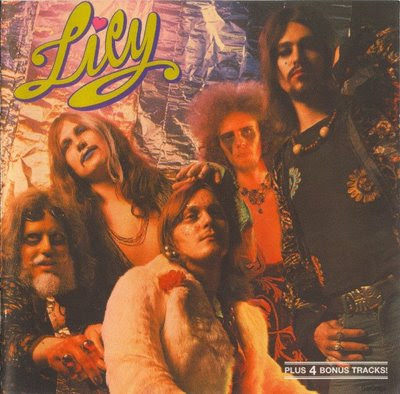 One such example was Frankfurt based band Lily. Originally named Monsun, the band's origins lie in the mid-sixties with a band called The Mods whose musical background initially consisted of playing beat music that then developed into soul and rhythm 'n' blues. The band who featured Manfred Schmid on guitar and Wilfried Kirchmeier on bass seemed to be heading places when they were offered a show on Hesse radio show called Beat Beat, which ion turn was used to showcasing more prominent musicians such as The Yardbirds and Cat Stevens. However one week prior to the broadcasting of the gig, Mods guitarist Michael Winzkowski (later to join Epsilon and the Michael Wynn Band) left the band who, unable to find a suitable replacement folded. By late 1968, Schmid had conceived he idea of forming a band that would be able to promote his left wing political beliefs. He was joined by Wilfried Kirchmeier as well as Manfred "Max" Schlagmьller (drums, percussion), Hans-Werner Steinberg (tenor sax, soprano sax, flute) and Helmut Burghardt (vocals). The last two had been members of Pinchfield Association, a soul band that had played often in various GI clubs in Germany. The band was to be called Monsun and originally the lyrics were all written in German. However this wold change when Burchardt left the band in 1969. The band toyed for a short while with playing just instrumental music, though they soon realised that they required a vocalist to help provide cohesion to their increasingly complex compositions. Thus Kirchmeier took over vocals duties too, and also enforced a radical change in direction when the lyrics were sung in English with aid in translation of the lyrics coming from Ulla Meinecke. By December 1970, the band started playing gigs in the Frankfurt area and soon became an established act on the musical scene playing entire concerts of their own compositions. By the spring of 1972 the band had also recorded a demo tape at a sound mixer school in Detmold, however Steinberg decided to leave Germany for a six month trip to India and his place was taken by guitarist Klaus Lehmann by May of that year. Steinberg returned to Germany in October 1972 to rejoin the band whose lineup was augmented to that of a quintet. During this period the demo tape that the band had recorded had reached the ears of Peter Hauke (The Rollicks), now a producer with the Bellaphon label and on hearing them play live decided to offer the band a recording contract with the label. Thus in January 1973, Monsun entered Dieter Dierks studios in Kцln-Stommeln for a three day recording session. The short duration of the sessions meant that the band had little or no time to re-dub or re-record certain parts of the material they recorded resulting in the raw sound that prevails throughout the album. The musical scene during early 1973 was at the height of the Glam rock era. Bellaphon had an artist, Tiger B. Smith, whose image was that of a Glam rock act and was currently selling well which also had the label thinking that their new act had to also follow suit. For starters the band had to change their name, and thus Monsun became Lily (a name that was brought up by Manfred Schmid). The band also reverted to wearing ladies clothes and make-up for the cover photos and the album was released as V.C.U. (We See You) (Bellaphon, BLPS 19144) in spring 1973. The idea of presenting the band as a Glam-rock act failed miserably. From the onset the band were severely criticised for their new image and even though they went on a promotional trip to London to distribute their album to agencies and clubs, the album flopped selling just over 1000 copies. Trouble was brewing within the Lily camp and by December 1973 Manfred Schmid is dismissed from the band due to musical differences. The decision was not unanimous, which resulted in further factioning within the Lily camp and Schmid took the news badly, destroying Schlagmьller's drum kit as well as his own equipment in the process. Furthermore Schmid started to have mental problems and passed though a phase of writing music with German lyrics that mirrored his mental state. He was dead by the mid-Nineties, found in Frankfurt's inner city wood under mysterious circumstances. Schmid's position within Lily was taken by a close friend of Lehmann, Bjцrn Scherer-Mohr who played both guitar and keyboards. The band tried to adopt a more commercial approach and by spring 1974, the band moved to Frankfurt Panne Paulsen studio to record a demo tape for their second album. The band started to introduce a comic element into their music, a move which the members enjoyed, yet which left producer Peter Hauke unimpressed, especially after the premise the band had created with their debut album.